Akamai published its quarterly “State of the Internet” report for the last quarter of 2012 today. The report, as usual, looks at global Internet speeds, as well as the state of Internet security, the number if IPv4 numbers in use and other similar metrics. Internet speeds, of course, are the most interesting numbers for users in this report. South Korea has long been in the lead in this category, and that’s not likely to change anytime soon. Interestingly, though, the average Internet speed in South Korea has slowed down a bit lately. At an average speed of 14 Mbps, South Korean Internet users now surf 4.8 percent slower than last quarter and 13 percent slower than a year ago. In the U.S., Akamai found, the average connection now clocks in at 7.4 Mbps. That’s up a respectable 28 percent year-over-year and 2.3 percent since last quarter and enough to rank the U.S. No. 8 on Akamai’s list. Currently, about 19 percent of U.S. Internet connections deliver speeds over 10 Mbps+ connections. It’s encouraging to see that this number increased 90 percent since last year, though growth in this metric seems to have stalled a bit, as the U.S. only registered a low 5.5 percent increase since last quarter. 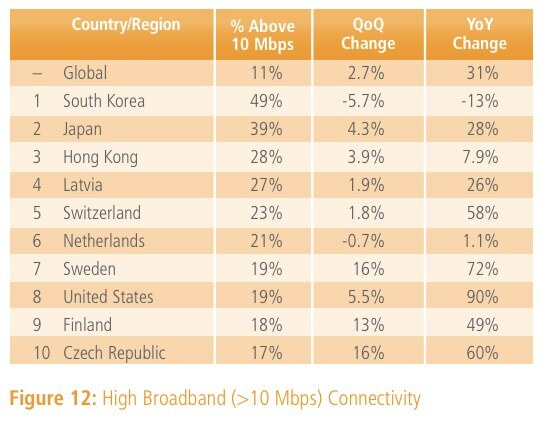 Overall, the 10 countries with the fastest connections saw relatively minor speed increases over the last quarter, ranging from just 0.1 percent in the Netherlands to 7.4 percent in Sweden. Globally, though, the average connection speed grew by 25 percent year-over-year. 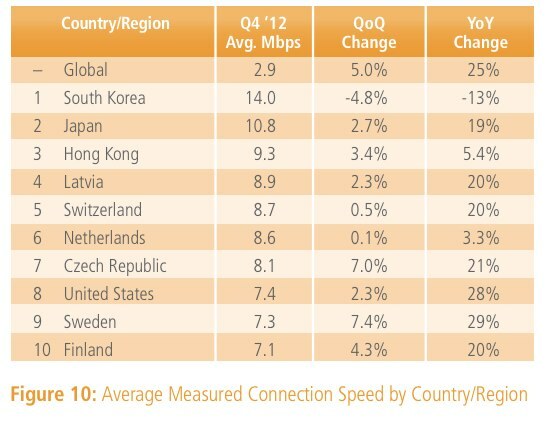 The only country to see a major dip in speeds since the last quarter was Guatemala (39 percent). As for mobile connectivity, Akamai reports that its partner Ericsson found that mobile data traffic around the world grew 28 percent in the last quarter alone and doubled year-over-year. Android and Apple’s Mobile Safari are almost even here when it comes to connections over cellular networks (35.3 percent vs. 32.6 percent), but taking all connections into account (that is, including Wi-Fi), Apple accounts for 58.7 percent of requests compared to 21.7 percent for Android Webkit. In this quarter’s report, Akamai is also taking a closer look at DDoS attacks. The company says its own customers reported 768 attacks in 2012, a 200 percent year-over-year increase. While this is not necessarily representative of the Internet as a whole, it’s yet another indication that the number of these attacks across the Interent continues to increase.